The K-mod is a popular power modification for certain CPS water guns. 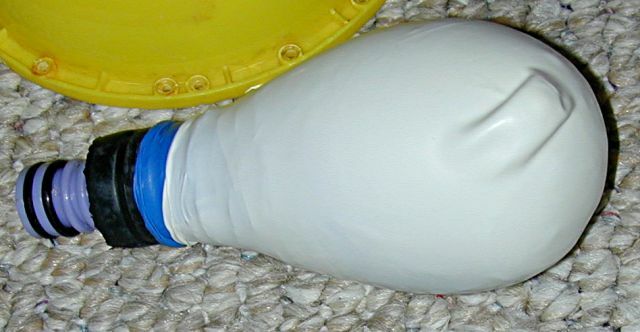 This modification increases the pressure some CPS water guns can reach by layering balloons over the rubber pressure chamber. Increased pressure results in greater range and water output. This modification only works on spherical CPS water guns such as the CPS 1000, CPS 1200, CPS 1500, CPS 1700, CPS 2100, CPS 2700, and CPS 1-3-5. It does not work on any air pressure water gun or any other type of CPS water gun. 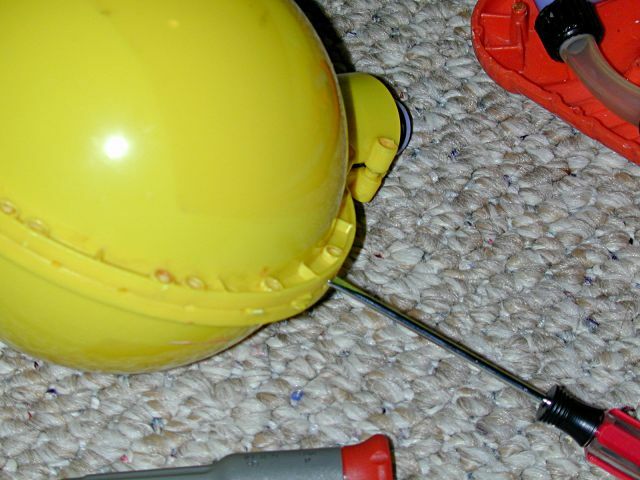 Spherical CPS water guns are no longer manufactured likely due to how easy this power-up is. If you have a cylindrical CPS water gun such as the CPS 3000, CPS 3200, CPS 2000, CPS 2500, or CPS 4100, you can still perform a similar power-up modification called Colossus. If you have a Water Warriors water gun, there is not much you can do aside from swapping pressure chambers, the experimental spring mod, or by replacing the chamber with a sheet of rubber. After this modification is completed, people typically add an extra zero to the end of the Super Soaker's model number. For example, a K-modded CPS 1000 becomes a CPS 10000. The extra zero signifies an increase in power. This renamed water gun then can be called a CPS 10K. Hence the name "K-mod." In a rubber CPS water gun, water is pumped into a rubber chamber, which stretches. Like a rubber band, the thicker the rubber is, the harder it is to stretch. The K-mod works on the same principle. Thicker CPS chambers mean higher pressures and higher performance. The extra pressure increases the water flow. The extra output increases the stream velocity. The extra velocity generally increases the range. Due to the many disadvantages, many people prefer lighter K-mods or not K-modding their Super Soaker at all. The increased output reduces shot time. The extra rubber takes up space, reducing the maximum capacity of the pressure chamber. Greater probability of breaks due to extra pressure. Greater probability of breaks due to removal of the pressure release valve with more powerful K-mods. The water gun may actually suffer from reduced range in some cases. Increasing pressure can create a turbulent stream with little coherence especially when combined with small nozzles. How much will the K-mod increase my range or output? How much of an improvement is seen in range and output depends on many factors, including, but not limited to, the number of balloons used, whether or not the nozzle has been altered, whether the pressure relief valve has been removed, and how many pumps the gun can take. The K-mod can and will decrease range if done incorrectly, however, this is generally not bad because the K-mod can be undone and the other factors affecting performance can be altered as well. Additional modifications, which I will describe in the instructions, can reverse many of the negative aspects of the K-mod. Range improvements can put your water gun easily past 50 feet of range. My CPS 27000 with 40 balloons (before it broke) could achieve about 55 feet of range. SSC staff member DX had a CPS 21000 that could shoot over 60 feet with many many layers. However, as diminishing returns is seen in higher number of layers, PC capacity is reduced, and the stress on the water gun increases, heavier K-mods are not recommended. Note that both my CPS 27000 and DX's CPS 21000 broke eventually. Very good range improvement can be attained with a limited number of balloons. * The number of balloons you need depends on how much of a power up is desired and other factors. Read the section below titled "Recommended number of balloons" for more information. 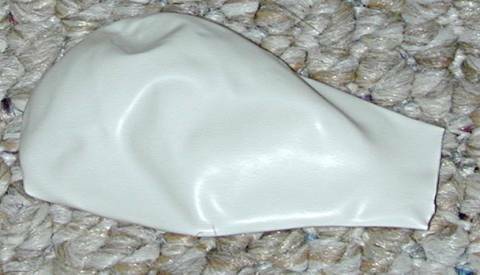 Smaller 9 inch balloons can not be used because they sometimes break and are very hard to layer. 12 inch balloons work best. A commonly asked question is whether bike tubes or rubber bands can be used instead of balloons. The answer is yes, they can be, but they don't work anywhere near as well as balloons do and they fall off easily. Bike tubes also are more expensive than balloons. The CPS 1000, CPS 1200, CPS 1500, CPS 1700, CPS 2100, and CPS 1-3-5 all can handle up to about 60 balloons without problems. "Reinforcement" by coating the firing valve in epoxy may be recommended on those water guns at 60 balloons or higher. The CPS 2700 should not take more than 30 balloons because its firing valve is weak and will crack. The pressure relief valve should not be disabled in a CPS 27000. If the pressure relief valve is not disabled, between 15 and 30 balloons can be layered. Testing to see which number of balloons activates the relief valve will determine the maximum power up possible without disabling the PRV. Some have put up to 100 balloons on their water guns, however, pressure cracks and problems with pulling the trigger result from higher pressures. Of course, how many balloons should be put on is a personal decision. Some people may not like the appetite for water that K-modded water guns have, and prefer a light or medium K-mod of 15 to 45 balloons. Indeed, light K-mods have less problems than "standard" and heavy level ones, so I suggest a light K-mod without disabling the PRV for general use. Are certain types of balloons better than others? Some people believe that pearlized balloons work better in K-mods. The only difference between pearlized balloons and regular ones is the coloration. No comparisons of pearlized balloons against normal helium balloons have been done, but no drastic performance increases were reported from use of pearlized balloons either. One company, Qualatex sells pure latex rubber balloons, which have superior durability, which should translate into more resistance. Another possibility for higher resistance might be dipping the bladder in liquid latex, but that has not been done yet. In this guide, I will switch between pictures of two different water guns I have K-modded as a picture serves the step best. The procedure is nearly exactly the same between all water guns that can be K-modded, so aside from some color differences, no other differences should exist. Before doing any of the instructions in the K-mod, test your water gun's range and water output. This will help you see the power boost and help in solving some problems you might have later. Open your water gun. Please read our guide to opening your water gun for tips and solutions to problems. Once the gun is open, locate the pressure chamber. 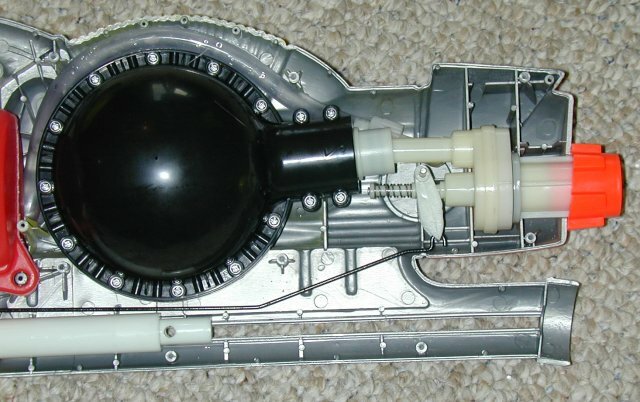 In the image below of a CPS 2100, the pressure chamber is the black globe to the left. Remove all of the screws. I stick them to a piece of tape, but other people prefer using a bowl or a cup. Then, pry open the case. Once you have the case open, remove the rubber pressure chamber. Below is an image of a bare CPS 2100 chamber. You will now need to layer balloons over it. There might be some strips of rubber coming from the pressure chamber, left over likely from the process that made these chambers. The extra rubber can be cut off, however, be careful not to puncture or cut off any part of the rubber bulb. Prior to layering the balloons over the pressure chamber, they need to be cut. 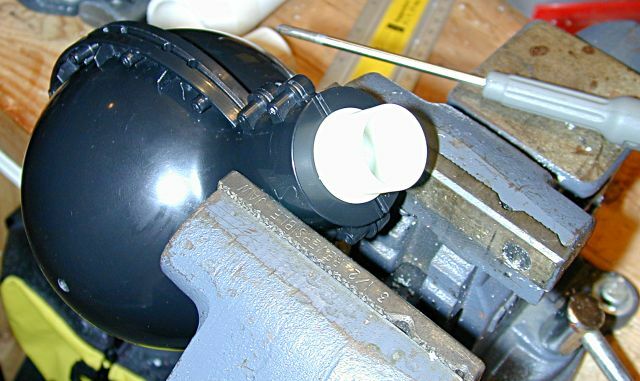 The spot on the pressure chamber where the bulb becomes flat is about where the balloons should be cut. You want to cover the entire curved area without covering the flat area because the curved area is what affects pressure, and layering over the flat area will only make the PC case harder to close. The balloon should be approximately in the shape of the pressure chamber. Layer the balloons on. Everyone develops their own method. I like to hold the bladder in a vice and then stretch the balloons over by grabbing the hole with both hands and stretching. The balloons are put over the entire bladder while stretched, so no lubricants are necessary at all. The vice method seems to give good results. If you don't have a vice, you can get a friend to hold the pressure chamber while you stretch the balloons over it. Add layer after layer. If you run into air bubbles like the image above, straighten out the balloon to remove the air bubble. When you have added all the layers you needed to, it is time to close the PC case. This step is where a vice comes in handy. The rubber in the flat area needs to be compressed a bit to get the case on. Line up all of the screw holes with the rubber PC in the space it was in previously. There will be lines on the rubber from the impression of the plastic. Place the case and pressure chamber in a vice with the teeth of the vice on the flat part of the case. Close the vice on the case. Screw all the screws into the case to close it. Now that the pressure chamber modification is complete, put the pressure chamber back where it was previously and close the gun. Test out the gun now. If you add more than 30 balloons it usually is necessary to disable the pressure relief valve, but testing can determine if that is necessary. If the gun can pump up and shoot more than a tiny shot, no additional modification is needed. If pumping the gun seems to not pump water into the pressure chamber, the pressure relief valve needs to be disabled. Sometimes the activation of this safety valve coincides with a squealing noise. Your gun also may be able to take a certain amount of pumps before the safety valve kicks in, so count the number of pumps as you test. If when testing, your pump gets very hard, do not continue pumping. Typically your pump will get very hard when the pressure relief valve was removed, but this can happen in some water guns as well. Test the range and water output for improvement. Improvement definitely should be seen in water output, but range can decrease. If range does decrease, some nozzle modifications may be necessary to prevent the stream from accelerating so fast that drag tears it apart. Drag is your biggest enemy here, and its effects can be prevented with larger streams. If the amount of water in your pressure chamber seems to have been reduced, that's because it was. The additional rubber takes up space in the pressure chamber. For that reason, a pressure chamber expansion modification might be necessary to restore the capacity of the pressure chamber. You might want to reopen the gun to add or remove layers as you see fit. The good thing about the K-mod is that you are given a wide range of potential power. Problem pulling the trigger - If you put too many balloons on the PC, pulling the trigger can become difficult if not impossible. Read our repair article for potential solutions to that problem.